Two new Index Systems rank countries for sustainability and corporations for promoting health. The Economist and Barilla have devised a new, interactive Index that ranks countries on the basis of food loss and waste, sustainable agriculture, and the ability to meet nutritional challenges. Its scoring system goes from 0 (terrible) to 100 (perfect). None of the scores is exemplary. The US rank is #26. The Access to Nutrition Foundation (Netherlands) ranks corporations on their strategies, policies, and actions to address obesity and diet-related diseases in the US. The overall rankings, shown here, are relatively low. Some do better than others on governance, products, accessibility, marketing, lifestyles, labeling, and engagement. The highest scores are for labeling. The lowest scores are for accessibility. Indexes like these are useful for understanding where we are. They should inspire us to action. Campbell’s has just announced that it will divest its portfolio of healthier foods: Bolthouse Farms carrots, organics, salsa, hummus and dips, fresh soups. Why? Activist shareholder pressure to make more money, faster. These healthier-for-you products only generated $2.1 billion in sales last year, not nearly enough apparently. While waiting for someone to buy them, or the entire company, the company’s new CEO plans to concentrate on “operational discipline,” which I assume is a euphemism for firing lots of people. The CEO plans to focus on the money-making “core” products: Campbell Soups, Prego, V8, SpaghettiOs, Kettle Chips, Mlano, Goldfish and other such things. As I keep saying, food corporations cannot be expected to be agents of public health as long as Wall Street investors call the shots. Remember when Jeffrey Dunn’s Bolthouse aimed to make carrots “cool?” And kids would eat them if they were marketed like junk food? I guess this strategy didn’t work, alas. Since September, the New York Times has been investigating how the food industry markets its products in the developing world, and how this marketing is encouraging a rising prevalence of obesity and its health consequences. The series is called Planet Fat. This is the complete set to date, in reverse chronological order. If you haven’t read them, this week is a good time to catch up. Enjoy! India is “sitting on a volcano” of diabetes. A father’s effort to ban junk food sales in and near schools aims to change what children eat. When the food industry funds nutritionists, critics say it subverts science to preserve its market. Few predicted when Mexico joined the free-trade deal that it would transform the country in a way that would saddle millions with diet-related illnesses. She Took On Colombia’s Soda Industry. Then She Was Silenced. The debate over taxing sugary drinks has turned into a ferocious global policy brawl. In Colombia, proponents faced intimidation and censorship. For The New York Times’s West and Central Africa bureau chief, tastes of home in Dakar, Senegal, are a mixed blessing. The growing popularity of fried chicken and pizza in parts of Africa underscores how fast food is changing habits and expanding waistlines. As growth slows in wealthy countries, Western food companies are aggressively expanding in developing nations, contributing to obesity and health problems. In a series beginning today, the health and science desk explores the environment in which the obesity epidemic has come to a head. The article, which starts on the front page and continues to another two full pages and more, is headlined How Big Business got Brazil Hooked on Junk Food. It’s mostly about how Nestlé (no relation) recruits women in low-income countries to sell the company’s products from small mobile carts. Nestlé’s direct-sales army in Brazil is part of a broader transformation of the food system that is delivering Western-style processed food and sugary drinks to the most isolated pockets of Latin America, Africa and Asia. As their growth slows in the wealthiest countries, multinational food companies like Nestlé, PepsiCo and General Mills have been aggressively expanding their presence in developing nations, unleashing a marketing juggernaut that is upending traditional diets from Brazil to Ghana to India. Sean Westcott, head of food research and development at Nestlé, conceded obesity has been an unexpected side effect of making inexpensive processed food more widely available. “We didn’t expect what the impact would be,” he said. But of the 800 products that Nestlé says are available through its vendors, Mrs. da Silva says her customers are mostly interested in only about two dozen of them, virtually all sugar-sweetened items like Kit-Kats; Nestlé Greek Red Berry, a 3.5-ounce cup of yogurt with 17 grams of sugar; and Chandelle Pacoca, a peanut-flavored pudding in a container the same size as the yogurt that has 20 grams of sugar — nearly the entire World Health Organization’s recommended daily limit. The article is worth the read. Or see the 3-minute video for a quick summary. It also comes with a nifty interactive map of world obesity. Here’s the article en Español. And here it is em Português. Take a look at Center for Science in the Public Interest’s report on Carbonating the World, which covers much of the same territory for Coca-Cola. In the meantime, subsequent articles in this series are promised for soft drinks and fast food. Brazil’s food revolution is working! As she explains, Latin America is leading worldwide opposition to food industry marketing, and much is happening in Brazil. The local food system is being replaced by a food system that is controlled by transnational corporations…this dietary deterioration doesn’t just harm bodily health but also the environment, local economies, and Brazil’s rich food traditions. We are seeing a battle for the consumer. Over the last 30 years, big transnational food companies have aggressively expanded into Latin America. Taking advantage of economic reforms that opened markets, they’ve courted a consumer class that has grown in size due to generally increasing prosperity and to antipoverty efforts like minimum-wage increases and cash transfers for poor families. And as sales of highly processed foods and drinks have plateaued (and even fallen, in the case of soda) in the United States and other rich countries, Latin America has become a key market…In recent years, Brazil has inscribed the right to food in its Constitution and reformed its federal school-lunch program to broaden its reach while bolstering local farms. And in 2014, the Ministry of Health released new dietary guidelines that made healthy-food advocates across the world swoon [I did a post on them when they were released]. 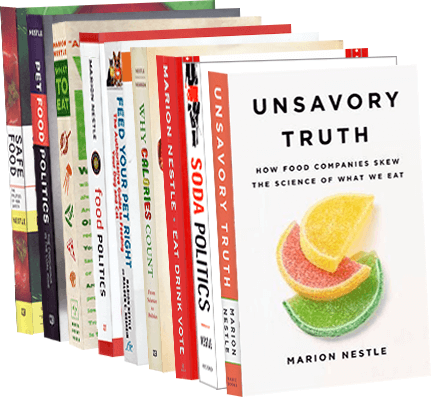 Monteiro helped lead the team that wrote them; the guidelines transcend a traditional nutrition-science frame to consider the social, cultural, and ecological dimensions of what people eat. They also focus on the pleasure that comes from cooking and sharing meals and frankly address the connections between what we eat and the environment. Huber’s investigative report is long and detailed, and well worth the read. Those of us advocating for food systems that are healthier for people and the planet have much to learn from our colleagues in the South. ‘Big Food’: taking a critical perspective on a global public health problem, by Simon N. Williams & Marion Nestle. The transitional dynamics of caloric ecosystems: changes in the food supply around the world, by Sanjay Basu. Big Food without big diets? Food regimes and Kenyan diets, by K. O’Neill. Density of outdoor food and beverage advertising around schools in Ulaanbaatar (Mongolia) and Manila (The Philippines) and implications for policy, by Bridget Kelly, Lesley King, Batjargal Jamiyan, Nyamragchaa Chimedtseren, Bolorchimeg Bold, Victoria M. Medina, Sarah J. De los Reyes, Nichel V. Marquez, Anna Christine P. Rome, Ariane Margareth O. Cabanes,John Juliard Go, Tsogzolmaa Bayandorj, Marie Clem B. Carlos & Cherian Varghese. Snack food advertising in stores around public schools in Guatemala, by Violeta Chacon, Paola Letona, Eduardo Villamor & Joaquin Barnoya. Comparison of food industry policies and commitments on marketing to children and product (re)formulation in Australia, New Zealand and Fiji, by Gary Sacks, Melissa Mialon, Stefanie Vandevijvere, Helen Trevena, Wendy Snowdon, Michelle Crino & Boyd Swinburn. Encouraging big food to do the right thing for children’s health: a case study on using research to improve marketing of sugary cereals, by Jennifer L. Harris, Megan E. LoDolce & Marlene B. Schwartz. Big Soda’s long shadow: news coverage of local proposals to tax sugar-sweetened beverages in Richmond, El Monte and Telluride. Laura Nixon, Pamela Mejia, Andrew Cheyne & Lori Dorfman. Big Food’ and ‘gamified’ products: promotion, packaging, and the promise of fun, by Charlene Elliott. Food as pharma: marketing nutraceuticals to India’s rural poor, by Alice Street. Thanks to Simon Williams for initiating (and doing the heavy lifting on) this project, and to all the terrific contributors.